This shadow box represents me because I chose to bring in objects that represented my identity as much as possible. My Ethnicity is Salvadoran and Mexican, my Nationality is American, and my Race is Hispanic. Now I’m gonna go into detail on why I added the objects I put in my shadow box and what they represent. The bridge is more of a decoration but I also put it because I really like the views of the Golden Gate Bridge and it’s just very nice to go there. I chose to include all the tickets that I added on the background because I got them when I went to L.A and San Diego with my family and I had a really good time. The graduation ticket represents an achievement because it was really nice seeing my family proud of me and I was proud of myself. I added the dance invitation because it was really fun that day and I got to spend the day with my friends and I really care about friends. I really like the sticker on the right because it’s really true and powerful. It says that women are strong and I really agree with that because most people assume the opposite. On the left I added a Disney character from the movie “Inside Out” and her name is Sadness I also added a little Eiffel Tower bracelet. I added Sadness because I wanted to show the dominant narrative about it because people assume that women are always emotional. I added the Eiffel Tower bracelet because someone close to me brought it from Paris and gave it to me. The pictures are about my childhood and I added a picture of my my brothers and me because I feel like family is very important. Joana’s Identity Box by Joana is licensed under a Creative Commons Attribution-ShareAlike 4.0 International License. Its me Paola I was so impressed that you go to share something from yourself. I love all the detail things that you have and how you talk about dominant narrative and connecting it to the real world. When I was reading your statement I got so connected with you and i love how you talk about were you’re from and kept telling us about you. One sentence that stand out o me was ” It says that women are strong and I really agree with that because most people assume the opposite”(Joana). I totally agree with you people see us as that but don’t really open up. Thanks for your writing. I look forward to see what you write next time. Hi my name is Tevita and i’m writing from Fremont High. I was very impressed on how you made that bridge and the car. Was it hard and did it take long? Did you have fun doing it? 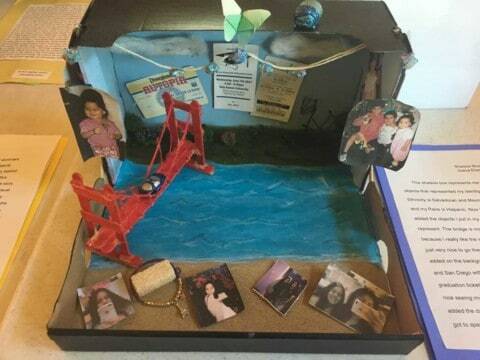 Dear joana,Wow i really like how you made your shadowbox and it looks interesting ,and i like that you put the golden bridge because i also like to go in any bridge having fun with my family.But i also i have a question for you .How many days you took to finish the bridge? .Who help you ?. I also make a shadowbox similar than yours but at Fremont high school. Thank you for taking time to read my description and looking at my shadow box. It was also cool to know someone new that also likes the bridge. For the first question, I made the bridge in one day and I did it myself. Thanks again for reading it and for asking questions. How do you feel about women being associated with emotions? Do you feel this is accurate, or was this more of a spur of the moment thing. How do you feel about your culture, and do you find it a constant part of who you are? Does it set you apart? I really liked how you put in the Golden Gate Bridge, even though youve never been there the fact that you like it says a lot on who you are, and what your passions are. Thank you for sharing! If you like the golden state bridge does that mean you like the golden state Warriors? Whose graduation ticket was it? Do you ever want to visit the tower? I liked it when you said, ¨I also love the country where my parents come from¨ because its a fact that some people think like that and we have to change that.